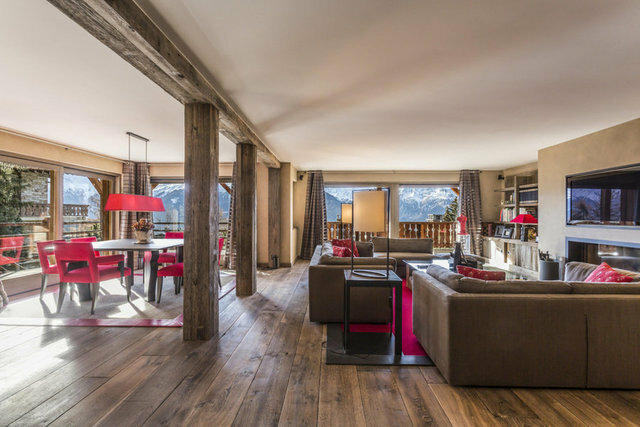 Bold, contemporary design meets alpine comfort in this exquisitely located alpine address at the heart of Verbier. A landmark in Verbier, this triple AAA location on the route de Ransou is steps away from Médran or Le Rouge ski lift linking to the main lift of Mayentzet. A natural perimeter of larch and flora provide a sense of privacy and tranquility. Currently outlined as an expansive 2-bedroom pied-à-terre this apartment can be easily re-designed to accommodate 3 or 4-bedrooms. Both bedrooms are currently located on the ground floor with access to its' private garden. An entirely separated kitchen allows for flawless entertaining in the spacious dining and living spaces of the upper floor. Unobstructed views of the Petit and Grand Combin glaciers as well as the private garden space can be enjoyed from both the living and dining room or alternatively from the contouring balconies. Two private parking spaces are accessible directly below the residences as well as a private ski room and storage space. With all of the luxurious conveniences in place this alpine escape can still be tailored to demand. This property is available for purchase by international buyers and can be used as a primary or secondary residence. The iconic Swiss resort of Verbier, with its world-class terrain and legendary après-ski, remains among the top ski destinations in the Alps. Situated in a sunny, south-facing bowl with spectacular views of the surrounding peaks, Verbier is less than 2 hours from Geneva Airport, close to the borders with France and Italy. Verbier is the main gateway to Les 4 Vallées ski area that features a sophisticated network of cable cars and gondolas providing easy access to 410km (255 miles) of marked runs, as well as some of Europe's best lift-served off-piste skiing. With its shops, restaurants, hotels and stunning views, but also with a nightlife second to none, Verbier attracts people from all over the world for unforgettable holidays. Thanks to the exceptional quality of life, events and services which include a private international school and a world-class classical music festival, Verbier is the home to a growing international community.